Welcome to your scuba diving adventure here in Nusa Lembongan! We have a range of options for beginners including the opportunity to just try diving for the first time with a PADI Discover Scuba Diving experience or to get certified with a full 4 day PADI Open Water Course. Don’t have time to take the complete Open Water Course? 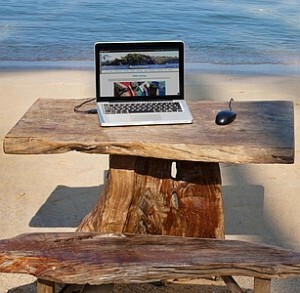 Check out our eLearning options below to start studying from home OR take the PADI Scuba Diver program and upgrade to Open Water at any time in the future, anywhere in the world! As a student diver at World Diving you will have unlimited access to our purpose built dive training pool, professional instructors and world class dive sites which will all guarantee the dive course of a lifetime. 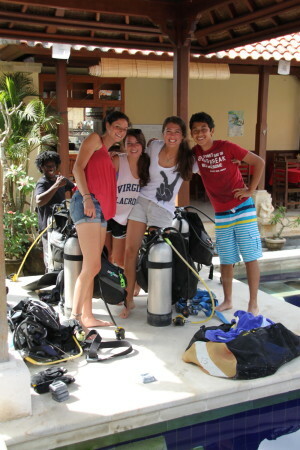 All of our courses adhere strictly to PADI standards. Our teaching groups are small with no more than four divers to any one instructor. We believe that you dictate the pace so that you get the maximum learning and the maximum fun! As a PADI 5 Star training centre we offer a range of options, make sure that you have the best environment to learn in and the best instructors to teach you. We choose the dive sites carefully so that students learn in conditions that match their experience. Our House Reef offers incredible corals, lots of fish and calm conditions for your first dives and for your last two certification dives we’ll take you out to dive Nusa Penida. How would you like to complete your certification dives with Manta Rays and Mola Mola? Some of our students have! Select the beginner course which suits you from the list below and let us know when you’d like to join us. The PADI Open Water certification is your ticket to the world. During this four day program you’ll take part in some class room study sessions, training dives in our purpose built pool and you’ll make four open water dives in the ocean. 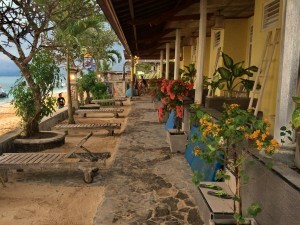 (Please note that if you study with PADI eLearning before arriving on the island, your program will be just three days with no classroom studying). 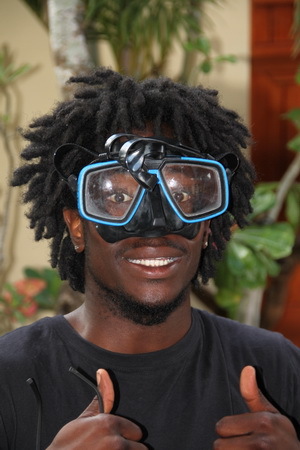 You’ll have a lot of fun, learn how to be safe diver and see phenomenal marine life. If you do not have three or four days free then try the two day PADI Scuba Diver course. This shorter course has three class and pool sessions then two open water dives. You will then be certified to dive with an instructor or a divemaster until you upgrade to PADI Open Water Diver which you can do at any time, anywhere in the world. (Rates include airport / hotel pick ups and drop offs in Bali, speedboat transfer to Nusa Lembongan, PADI Open Water Course in Nusa Lembongan, full equipment hire and accommodation including breakfast in our Sea View rooms). Whether you’re on the go or want to take it slow, now you can complete the knowledge development portion of the PADI Open Water Course, in numerous languages, online. It’s a great match for your active schedule as it means less time in the classroom and more time diving. After you complete all of the eLearning segments, let us know when you want to join us to start your underwater adventures. You’ll learn and master dive skills from our highly-trained Instructors during confined and open water dives. The skills you learn during these dives will prepare you to explore a whole new world. Start today for a lifetime of adventure and fun! Book your PADI Open Water Course in Nusa Lembongan with World Diving!